The Ancient Wonders of the World will appear on the map in Imperator: Rome, Paradox’s new grand stategy game coming out next year. 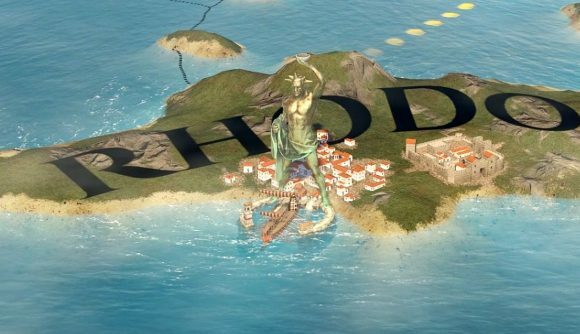 It’s not immediately clear whether they’ll influence gameplay, but you’ll be able to sail your ships under the Colossus of Rhodes, or march past Egypt’s Great Pyramids as you rule the Roman Empire. Joacim Carlberg explained that these wonders are, so far, mostly included as aesthetic flourishes rather than gameplay elements, but the effects of the wonders isn’t set in stone just yet. It’s possible that they’ll confer a bonus of some kind on the province where they’re located, but Paradox’s Imperator: Rome team hasn’t made a firm decision on that yet. Carlberg said the art team has been working from historical sources as much as possible for their designs of the wonders. In some cases, there are contemporaneous depictions that the artists can use as reference materials, as is the case with the Mausoleum at Halicarnassus or the Statue of Zeus at Olympia. For others, though, things are quite a bit more vague – historians aren’t entirely sure whether the Hanging Gardens of Babylon ever really existed, and if they did, if they were at Babylon to begin with. Imperator: Rome will be looking to other recognized Wonders of the World as well, beyond the traditional Seven Ancient Wonders. As you move away from the Mediterranean, you’ll be able to find others, such as Stonehenge, Carlberg explained. Imperator: Rome is expected to launch early next year.